Jaipur, the capital of Rajasthan is widely famous for its royal charm, vibrant Rajasthani cultures, and traditions, majestic forts, desert, etc. 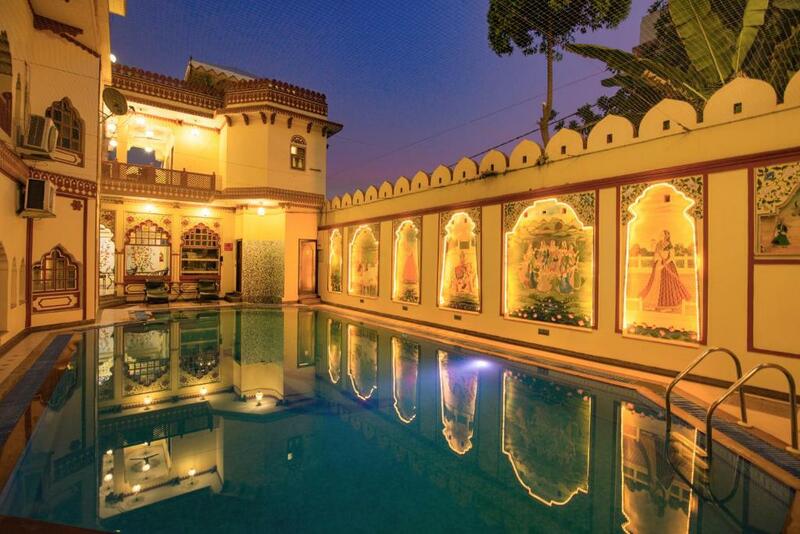 To get introduced with the royal lifestyle of Maharajas, Jaipur offers the best luxury heritage hotels in India. These luxury hotels offer you an opportunity to get indulge in the cultural heritage of Rajasthan. To ensure memorable vacations in Rajasthan under Rajasthan Tour Packages you must book your stay in these listed heritage sites of Jaipur. These heritage properties are historical palaces which are now renovated and used as a luxury hotel. Amongst the finest heritage hotels of Rajasthan which is designed with historic as well as modern time architectural style. Narain Niwas Palace Hotel is located in the center of Jaipur city which was built by General Amar Singh Ji in 1928, the then Thakur of Kanota. The hotel is well-designed and furnished with Indian and Rajput furnishing styles. The guests are welcomed with a warm Rajputana hospitality and are served with the best services of the hotel. Services: Museum of old arms, saddler & buggies, library with rare books & manuscripts, beautiful garden, multi-cuisine dining facility, puppet show, horse riding, etc. Achrol lodge/house is located on the outskirts of the city and is surrounded by the Aravalli Mountains. The hotel is also known as Treehouse Resort which covers 7 acres of land which contains 40 rooms and villas overlook the vast verdant lawns or the vegetable gardens in the premises. One can enjoy the weather in their separate private balcony, sipping a cup of tea or simply getting relaxed in the pleasing atmosphere. Services: Dining, fitness recreation, prompt service, arrival information. Managed by the erstwhile Rathore family of Jodhpur, Umaid Bhawan Palace is a heritage property which is featured with world class Rajasthani style accommodation. The palace is praised for well-appointed rooms, royal decorations, and excellent amenities, world-class services that lead to a highly comfortable and luxurious stay in Jaipur. Location: D1-2A, behind collectorate via Bank road, Bani Park, Jaipur – 302016, Rajasthan, India. Services: Royal dining, fort view restaurant, the bar, car rental, tailor-made tours, and safaris, etc. The most popular heritage property, Neemrana Fort takes pride in being a heritage hotel in Rajasthan. The hotel is featured with two state-of-the-art lifts to ensure that their guests could enjoy the authenticity of the fort. Neemrana Fort has 74 luxury rooms & suites that offer a vibrant site for magical weekend getaways, feasts, celebration and business conferences. The palace is bounded with hanging gardens, two swimming pools to swim, an Ayurvedic spa, and India’s first zip-line which you can experience in the hotel. Services: Swimming pool facility, Ayurvedic spa, Zip lining, celebrations, business conferences etc. One of the finest heritage hotels in Jaipur, Hotel Madhuban is praised for representing a perfect mix of luxurious comforts and warm hospitality of Rajputana culture. The hotel is managed and run by erstwhile Patan ruling family which offers a comfortable stay in the relaxed and peaceful ambiance and the pleasure fo traditional Rajasthani hospitality. Location: D-237, Bihari Marg, Banipark, Jaipur – 302016, Rajasthan India. Services: Musical evening, Rajasthani dining, Wi-fi access, and Travel assistance. Aforesaid is the list of top 5 luxurious hotels in and near Jaipur which you can opt for your accommodation facility in your Rajasthan Tour Package. Surefire Tips to Fix Issues with Roku IR (Infrared) Remote	We Answer Your Pool Service Questions: Why Is My Pool Water Cloudy?